The interplanetary internet has been used by an astronaut at the International Space Station (ISS) to send commands to a robot on Earth. The experimental technology, called Disruption-Tolerant Networking (DTN) protocol, could be a future way to communicate with astronauts on Mars. Currently, if there is a problem when data is sent between Earth and Mars rovers, information can be lost. The DTN could offer a more robust way to send data over the vast distances. 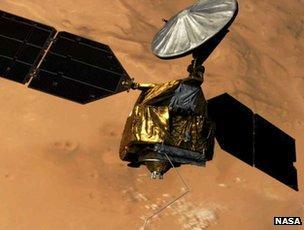 The European Space Agency (Esa) and Nasa conducted the experiment in late October. ISS Expedition 33 commander Sunita Williams used a laptop with DTN software to control a rover in Germany. The DTN is similar to the internet on Earth, but is much more tolerant to the delays and disruptions that are likely to occur when data is shuttling between planets, satellites, space stations and distant spacecraft. The delays can be due to solar storms or when spacecraft are behind a planet. "It's all about communicating over large distances, because the 'normal' internet doesn't expect that it may take minutes before something is sent for it to arrive," Kim Nergaard from Esa told the BBC. The work on the DTN was first proposed a decade ago by Vint Cerf - one of the creators of the internet on Earth. The technology was first tested in November 2008, when Nasa successfully transmitted images to and from a spacecraft 20 million miles away with a communications system based on the net. The system uses a network of nodes - connection points - to cope with delays. If there is a disruption, the data gets stored at one of the nodes until the communication is available again to send it further. This "store and forward" mechanism ensures data is not lost and gradually works its way towards its destination. "With the internet on Earth, if something is disconnected, the source has to retransmit everything, or you lose your data," said Mr Nergaard. "But the DTN has this disruption tolerance, and that's the difference - it has to be much more robust over the kind of distances and the kind of networks we're talking about." Currently, to communicate with Curiosity, the latest rover that landed in Gale Crater on the Red Planet on 6 August, Nasa and Esa use what is called "point-to-point communication". "Normally, the rover on the surface of Mars is commanded directly from Earth, or in some cases using spacecraft orbiting Mars as data relay satellites - but it's still considered single point-to-point communication," said Mr Nergaard. "It's not built-up as a network. There are several rovers on the surface of Mars, many spacecraft orbiting Mars, but they are all seen as individual items. "But the idea is that in the future rovers on Mars and spacecraft orbiting it will be treated as a network, so that you can send things to the network just as you send things using the internet on Earth. "It will still be via radio waves, but over different frequencies, to allow you higher data rate communication than the ones used today." Nasa's Badri Younes said that the test was a success, and it demonstrated "the feasibility of using a new communications infrastructure to send commands to a surface robot from an orbiting spacecraft and receive images and data back from the robot".